Review by AllTheBestFights.com: 2018-06-02, good fight between Emanuel Navarrete and Jose Sanmartin: it gets three stars. Emanuel Navarrete entered this fight with a pro record of 24-1-0 (21 KOs=87%) and he is ranked as the No.10 super bantamweight in the world (currently the #1 in this division is Luis Nery). He suffered his only loss when he faced Daniel Argueta in 2012, since then he has collected 19 consecutive victories beating Glenn Porras and Breilor Teran in 2018. His opponent, Jose Sanmartin, has an official boxing record of 26-4-1 (17 knockouts) and he entered as the No.101 featherweight. He lost to Tomas Rojas in 2016 but then he has won six bouts defeating Marlembron Acuna in his last one. 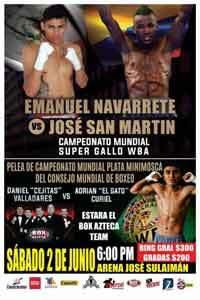 Navarrete vs Sanmartin is the main event of the evening. Watch the video and rate this fight!